Located in the Minnesota region, Bloomington is a town and its area, population and various key information is listed below. For all your administrative procedures, you can go to the city hall Bloomington at the address and times indicated on this page or contact the town hall’s reception by phone or by email depending on your preference or the information available. Bloomington satellite image: Bloomington town from the sky! Located 6 miles from Minneapolis-Saint Paul International Airport, this hotel offers free airport shuttles, an on-site restaurant and indoor pool. Its spacious rooms feature flat-screen cable TVs with pay-per-view movies. Just off Interstate 494 and 10 minutes’ drive from the Minneapolis-St. Paul International Airport and Mall of America, this Bloomington hotel features rooms with 40-inch flat-screen TVs. A complimentary continental breakfast is served each morning. This Bloomington hotel offers visitors comfortable accommodations with easy access to attractions including the Mall of America, area theme parks, and sports and entertainment venues. Located just off Interstate 494, this Bloomington hotel offers a free shuttle service to Minneapolis–Saint Paul International Airport, which is 10 minutes’ drive away. Free Wi-fi is available in each guest room. 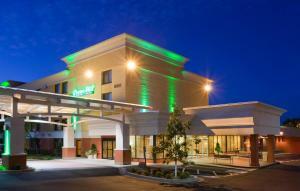 This Bloomington Hotel is 5 minutes' drive from Minneapolis-Saint Paul International Airport and the Mall of America. The hotel offers a daily continental breakfast and guest rooms with free Wi-Fi.